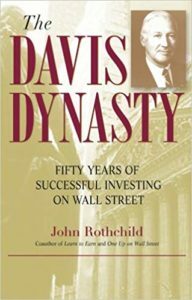 John Rothchild tells the story of the Davis family and their fifty years of investing on Wall Street. The story starts with Shelby Cullom Davis’s frugality, save first, opportunity seizing mentality, which he passed onto the next generation. The added contrast of market events during his life show what it took to build a fortune over five decades. Davis Double Play = Earnings growth plus multiple expansion. A company’s earnings growth gives the stock an initial boost, then investors put a higher price tag on earnings (multiple expansion), giving the stock a second boost. A company with a P/E 10 earning $1 per share is priced at $10. When the company doubles its earnings over a number of years and the market values the company at a P/E 20 the price jumps 4x to $40. This is why value and growth are tied at the hip. Shelby Cullom Davis proved you don’t have to start early to make a success of it. He was 38 (1947) when he started. Died in 1994. Bonds outperform intermittently but mature. Stock can be held indefinitely. Great investing requires an independent spirit and the courage to buy assets everyone else disdains. Disdain creates bargains. Davis was extremely frugal (why waste money that could be invested?). He passed frugality on to his children and grandchildren. Examples of his extreme frugality: tattered pants, moth-eaten sweaters. He’d rescue shoes from the trash and repair them with glue, tape, and rubber bands. The old gas stove was so rusty, flakes fell off in the food (yet had a hired cook). Promised the kids a pool but only if they dug it themselves. The surest way to build wealth is to spend less than you make and put the balance to work in stocks. Shelby Cullom Davis turned $50,000 into $900 million — 18,000% return — from ’47 to ’94. Made the made the Forbes list of wealthiest Americans in ’88. Looked for compounding machines — not at the next quarter’s earnings but the next decade’s earnings. Bear Markets — most of the wealth created in prior bull market disappeared due to owning the hottest stocks in the hottest sectors. Each bear market the average mom and pop investor fell out of love with stocks. That was when Shelby bought. Emerging Markets — many have been burned funding the growth of emerging countries. Emerging doesn’t always equal profits. It happened to British investors in U.S. rails during the 1800s. Same with U.S. investors funding Asian market growth in the 1900s. Davis was stingy, didn’t try to time the market, just recognized cheap, then waited. He bought an NYSE seat for $33k in ’41. A year later seats sold for $17k. Rose to $97k by ’46. On Margin — paid cash for his house, but bought stocks on margin. Davis believed leverage with stocks was a better profit booster than a mortgage would ever be. Stocks vs Bonds — Bonds won the 1930s and investors continued to believe the same would happen into the ’40s. Yet, Davis preferred stocks during the bond loving ’40s. The low-interest rates (April ’46 Treasuries rates bottomed at 2.03% – 25 years to double money) was pathetic compounding to Davis. A stock is a piece of a company with unlimited upside. A bonds biggest reward was giving principle back plus interest no matter how well the company did. History showed that governments and bonds didn’t get along, thanks to inflationary practices during and after major wars i.e. inflation ate a big chunk of bond earnings and principle buying power. The 1940s began the 34-year bear market in bonds. Investment 101: Avoid bonds when CPI is rising. Avoid bonds after a costly war. Savings account and bonds that don’t beat inflation deplete wealth. That’s what happened in the late 40s. Yet, savers lost money but didn’t complain because they weren’t “losing” money in the markets. Insurance companies weren’t earning due to low-interest rates, low bond yields. Couldn’t make much more than reserves needed to cover claims. The biggest problem was how to invest the proceeds. The typical insurer sold for less than book value. Investor got underlying insurance portfolio (bonds and other assets) plus the insurance business for free, plus dividend. Compounding Machines — a low cost to run, no factories, and no machines to upgrade/replace every few years means the company takes a small hit when inflation rises. After WWII, returning soldiers drove insurance demand — a very conservative time. The public still hated Wall Street in ’48. Davis only bought on margin when low prices offered a margin of safety, unlike those who bought stocks at sucker prices. Davis’s favorite question: “If you had one silver bullet to shoot a competitor, which competitor would you shoot?” Then research the competitor. A company feared by its rivals must be doing something right. He looked for companies with great leadership. He visited company headquarters to talk to management. 1965 Fed Chair William McChesney Martin said, “disquieting similarities between our present prosperity and the fabulous Twenties.” It took two generations to forget about the roaring ’20s and crash before exuberance returned. It lasted four more years – didn’t end until ’69. The last stage of a Bull Market — Mass transfer of assets from pros (smart crowd) to mom and pop investors (the naive crowd) as public flocked into the markets, driving prices higher, and exuberance lasted another 4 years before it ran out of buyers. 1969 — high stock turnover, high mutual fund turnover. The late ’60s kicked off the growth fund craze. Momentum driven stocks soared. Investors became performance chasers, moving in and out of the top mutual funds. Buffett closed his partnership in 1969 and bought municipal bonds. Electronics were hot stocks of the ’60s and Nifty Fifty. A study by Twentieth Century Fund found that blindly owning the entire market from 1960 to 1968 was more rewarding than paying a fund manager to pick stocks. ’69 bull market ended and the market continued falling into 1970. Both inflation and recession existed. Economists called it stagflation. Dow down 36%. Hot stocks and electronics got killed, down 77% on average. Davis taught kids: Don’t be a bondholder, because then you’re only a lender, not an owner. Owners are far more rewarded. More wisely you invest, the faster your bankroll expands. Know the rate of return on your investment because the Rule of 72 will tell you how fast you’ll double your money, an extra 1-2% makes a huge difference. A dollar spent was a dollar wasted; a dollar unspent could be invested to compound. Money was like water to a desert tribe. Wasted, it was potentially toxic. Saved, it was a nourishing substance. Eventually, all growth/momentum stocks come to an end. Corporate managers tend to emphasize the positives and ignore the negatives if they can get away with it. Manufacturers are expensive to operate: costly factories, equipment, repairs, upgrades, that deplete cash at the worst possible times (especially during high inflation), tend to lose money in recessions, always vulnerable to new tech, invention, innovation, process, etc. to put them out of business. The history of manufacturing has few long-term success stories and survivors. Must be able to reinvent themselves or fail. Not like banks or insurers: high costs still matter but less affected by inflation, invention, tech, etc. The goal is long term capital growth with reasonable safety. Always bullish on stocks because earnings follow the economy. The US economy has a habit of doubling in size every 16 to 18 years, going back more than a century. If history repeats itself, the average adult life sees the economy doubling eight times, thus an eightfold increase in earning, and in stock prices, plus dividends. When stocks rise faster than earnings, the investor sees better results. The critical ingredient behind compounding is time. Following the bear market of 1973-’74, stocks still looked cheap in ’76. Buffett said he felt like an oversexed teenager at a dance hall. Three phases to Davis’ s financial life — learn, earn, return. Learn phase lasted into his early 40s, earn phase lasted the next 3 decades, return phase was setting up a plan for the next generation or whoever would get the money when he was gone. 1979 — stocks were priced for terrible news and selling for less than book value, single-digit P/E’s. The 1980s — the Fed fights inflation. Prime rates rose to 20.5% and 30-yr Treasuries hit 15% (bond deal of the century which few people were buying). The average investor couldn’t see past high inflation to notice the great deal of 15% Treasuries. Always too focused on the short term worry. Gold and silver prices soared in 1980. High demand, fear buying that tanked after gold bugs predicted higher prices. 1981 – recession and the Dow fell 24%. The last bear market before a 20-year bull run. Inflation subsided, Fed cut rates, commodity prices fell. Late 1980s – Reagan added $1 trillion in new debt. Low rates drove consumer/corporate borrowing and overpaying on assets. Mike Milken led the junk bond frenzy, the famous Predator’s Ball, leveraged buyouts and hostile takeovers. Best time to buy banks is during a recession because investors become pessimistic. The 1980s brought trading back in vogue. Newsletters popped up to profit off the fad. 1987 crash — Dow lost 23% on Black Monday. 36% from the high. Pundits called for further losses — end of the world calls. Experts were wrong. Key to insurance stocks (and most businesses) — Own the low-cost operators. Long term Buy and hold – Once he bought winning companies, his best decisions were never to sell. As long as he believed in the strength of leadership and the companies ability to compound, he held on. A few big winners are what count in a lifetime of investing, and these winners need many years to appreciate. A young, inexperienced investor has a built-in advantage over a mature, sophisticated investor — TIME. 1991 – recession. Banks had trouble due to the high debt of the ’80s. Citicorp was too big to fail in the late ’80s. Japan in the ’90s was like the US in the ’30s. The similarity between the late ’60s and ’90s: ’69 was computer peripherals, mainframes, and electronics companies. The ’90s were Dotcoms, chip makers, networking, and connectivity. All high P/E stocks which everyone was buying. ’20s -> ’60s -> ’90s = about 30 years to forget each prior blowout/bust or 1 generation removed from each high P/E crash event. Ben Graham issued a market excess warning in the 60s. Buffett did it in the 90s. The Fed called market exuberance each time too – William McChesney Martin in ’65 and Alan Greenspan Dec. 5, 1996. Both markets continued higher for 4 more years. Save to invest more, not invest to save less. The 1990s again drove high debt use, this time by consumers. People borrowed to pay bills, borrowed against homes to buy stuff, which doesn’t make debt work for you. The 1990s — like each boom before it, only the short term performance mattered to investors, media, and pundits. Mutual funds were graded based on a performance of 6 months or less. The problem with performance rankings tends to give the illusion of consistency that doesn’t exist. 1, 3, and 5-year results are a poor measure of success. A fund can lag for 4 years straight then have a blowout 5th year, where it ends up at the top of a 5-year performance ranking (likely nobody owned it that 5th year). A 5 or 10-year rolling return is the truest test of stock picking talent. Creative accounting pops up in boom times — happened in ’69 and late ’90s, where some “companies were fluffing the books to meet Street expectations and create an illusion of predictable success.” Saw this in ’08 too. Tech isn’t predictable. Most pioneering companies that transformed the country are no longer in business. Tech is replaceable, can be out-innovated, and become obsolete. Buffett called the 1999 top. Most people were buying the market at 50x earnings after fees (Fortune 500 companies were selling at $10 trillion, on $300 billion of earnings, minus the 1% fees or $100 billion, gives a payoff of $200 billion). Buffett said the market had to sell off slowly or quickly or stay flat until earnings caught up. It couldn’t rise further without violating the laws of financial gravity. $3 trillion valuation on $200 billion is reasonable, not $10 trillion. Best bear market protection — buy companies with strong balance sheets, low debt, real earnings, and powerful franchises. These companies can survive bad times and eventually dominate weaker competition who are forced to cut back or shut down. Owner Earnings — the amount of reward pocketed each year, after reinvesting cash to maintain the status quo, but before reinvesting for growth and adjusted for stock options, depreciation, amortization, and deferred taxes. Owner earnings are almost always lower than reported earnings. How much to pay for a company — compare “owner earnings” yield to Treasury rates. Divide owner earnings by stock price to get yield. A $20 stock with $2 of owner earnings, yields 10% ($2/$20). A $70 stock with $2 of owner earnings, yields 2.9% ($2/$70). The smart investment goes to the higher yield of the two: owner earnings yield or Treasury rate. A superior investment is a company with a growth rate faster than the P/E multiple. Beat down stock of solid companies means investors have low expectations (most risk is already priced in) = great time to buy. Avoid cheap stocks = some cheap stocks are cheap for a reason. It’s a poor company and may stay that way. Buy moderately priced stocks in companies that grow moderately fast. Wait until the price is right = Industries have bear markets. Companies can have bear markets too. The biggest lesson you can learn is that the market doesn’t exactly repeat itself. Know history and how investors reacted but don’t rely on it to turn out the same. Don’t focus so much time looking at the past that you only look backward into the future.